BUFFALO, N.Y. -- October brings us the best baseball of the year in the Major Leagues. And for Bisons fans, that also means plenty of former members of the Herd to root for! With the one-game tie breakers and Wild Card matchups in the rearview mirror, there are now eight great teams still standing in the MLB playoffs. And each one of them will have a former Bison in uniform. The Cleveland Indians lead the way with three former Bisons players on their ALDS roster with outfielder Melky Cabrera and designated hitter Edwin Encarnacion and reliever Oliver Perez. All three made injury rehab appearances with the club with the southpaw Perez appearing in a pair of games in 2009 and 2010 while the Bisons were affiliated with the Mets. Encarnacion made one of the biggest rehab splashes for the Herd in recent memory, hitting a grand slam in his second at bat with Buffalo on August 12, 2014 against Norfolk. Cleveland total of former Bisons goes to four if you include pitching coach Carl Willis, who held the same post in Buffalo. 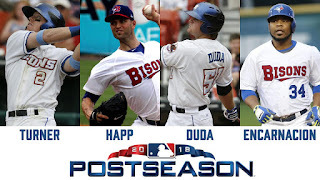 Then there are four teams with a pair of former Bisons on their postseason roster in New York, Atlanta, Milwaukee and Houston. The Yankees have two more former Herd southpaws, J.A. Happ and C.C. Sabathia. Happ made four starts with the Herd between 2013 and 2014 while Sabathia joined the club on a rehab assignment in 2006 and won his only start with the club. The Braves have the most Bisons home runs on their roster with Lucas Duda and Rene Rivera. Duda's breakout season in the Mets minor league system came in 2010 when he averaged .314 with 23 doubles, 17 home runs, 53 RBI and a .610 slugging pct. in 70 games with the Herd. With more time in Buffalo in 2011 and 2012, he has a total 30 Bisons home runs to his name. Rivera had nine home runs in 68 games with the Herd in 2009. The Brewers postseason roster includes former Bisons reliever Jeremy Jeffress and former Herd catcher, Erik Kratz, while the Astros have former Buffalo arms Collin McHugh and Roberto Osuna, who played for the Bisons just this past season. Boston also sports a Bisons player from 2018 as outfielder Steve Pearce appeared for the Bisons before his trade to the Red Sox where he joined another former Buffalo player, manager Alex Cora. One of the most popular players in Los Angeles, Dodgers third baseman Justin Turner played 90 games with the Bisons from 2010-2012. In that first season, the infielder hit .333 with a .390 on-base pct. in 78 games with the team. He of course now plays for manager Dave Roberts, the Bisons all-time stolen base king. That leaves the Rockies, who don't have a former Bisons player on their team. However, they are led by manager Bud Black, who was the Herd's pitching coach in 1998. So there you have it Bisons fans. Plenty to root for this October. Enjoy the playoffs!